A bit of a mini-exclusive here at mou.me.uk. I’m told the Kaiser Chiefs are as good as confirmed for Glastonbury 2009 by a “source close to the bands management”. How much of an exclusive it really is is debatable, seeing as they seem to play every year… But still, its confirmed, and seeing as I haven’t seen it on any other websites, as far as I’m concerned its an exclusive! 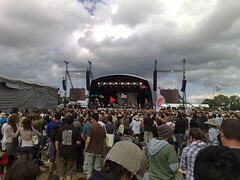 Tagged in: glastonbury, glastonbury 2009, kaiser chiefs. Please don’t let it be true. 2nd worst band ever ever IMHO, playing second fiddle worstness to the truly dreadful Nickelback. Ditch the Indie and listen to something decent 😉 But hey… at least you like The Postal Service. You should really think about listening to some Justice- you will love them! Perhaps some Digitalism too? Yeaaah! How about Gilbert O’Sullivan again? Kaiser Chiefs hmm…I predict there will be a riot!